As mentioned in earlier pages, Dr Gillon was the resident 'Surgeon Superintendent' when the hospital opened in Newtown in 1881. During the period 1881 - 1889, the resident surgeon was not in fact responsible for any surgery undertaken at the hospital; rather, this was the role of the visiting honorary surgeons. The resident surgeon lived in the upper level over the main entrance to the hospital, as seen in the photograph to the right. There was a rapid succession of resident surgeons over this period. In three instances, the incumbents left employment amid controversy, and two other appointees were temporary, being brought in at short notice. The first controversy arose during Dr Gillon's tenure. Complaints were made by the Steward and other staff about the management of the hospital by Dr Gillon, and about Dr Gillon's behaviour at times. Before the Hospital Management Committee had had time to investigate these complaints, Dr Gillon wrote to the City Council demanding a full inquiry. An inquiry was held, and is well-reported in issues of the NZ Mail between 28 August and 7 October, 1882. The Management Committee held 9 meetings, interviewed 48 witnesses, and eventually concluded that there was no substance in the claims against Dr Gillon. Despite the favourable findings, Dr Gillon resigned. The second controversy occurred during the tenure of Dr Hammond, successor to Dr Gillon. Complaints had been laid about Dr Hammond's alleged general harshness towards patients. The Honorary Medical Staff had apparently stated that they could not work with Dr Hammond. Dr Hammond demanded an inquiry, but this was refused. He then requested leave to publish in the NZ Mail details of the allegations and his response, but was refused such leave on the grounds that this was contrary to the rules of the Civil Service. The Government intervened and 'granted' Dr Hammond immediate leave of absence until the end of 1883, at which time his appointment would end. Dr Chilton was subject to official criticism made to the Colonial Secretary by a group of patients in August 1885. 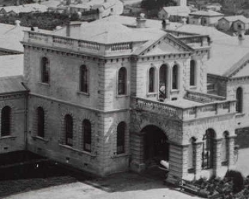 As a result, Dr Chilton was summarily dismissed, without a formal inquiry, and the Medical Superintendent of Mount View Asylum, Dr Levinge, was made Acting Superintendent of Wellington Hospital. Dr Chilton professed his innocence, and was supported by a number of nurses who were also dismissed for making their support public. Furthermore, a petition from a group of male staff members failed to reverse any of the dismissals. These matters are reported in detail in the NZ Mail on 21 Aug 1885 and 28 Aug 1885. Although he did have administrative duties, the clinical role of the 'Surgeon Superintendent' was that of a house physician or house surgeon. This situation changed, however, after the appointment of Dr John Ewart as Resident Surgeon Superintendent in 1889, for Dr Ewart was to take a very active role in surgery at the hospital. 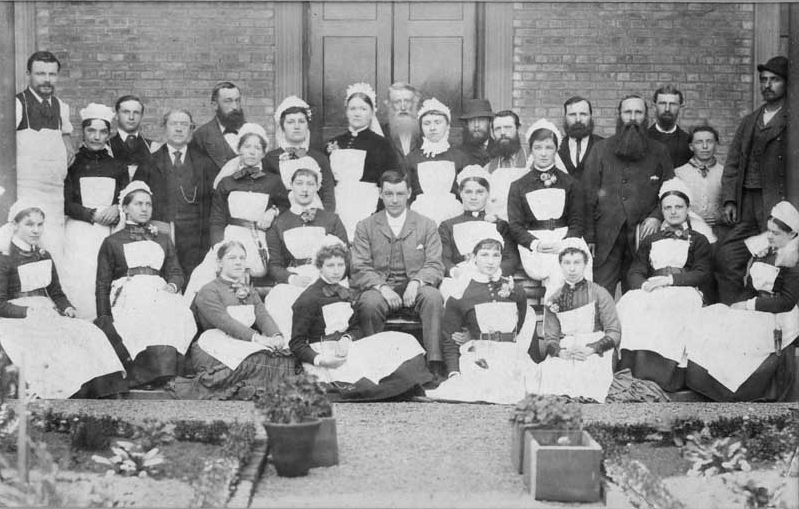 The resident surgeon was the only resident medical officer (prior to 1903), and he worked with a total salaried staff complement of around 30 - 40 persons, as this 1885 staff photograph shows. The terms 'Resident Surgeon', 'Surgeon Superintendent', and 'Medical Superintendent' were used more-or-less synonymously in the early years. To avoid confusion, 'Medical Superintendent' will be the term used in subsequent pages. Last updated 10 December 2016.